​Only Believe Ministries was founded in 2006 by Terry Kielhorn, Cindy Blackburn, and Angie Hoffman, three sisters from Southern Illinois. All three sisters are ordained ministers through International Gospel Outreach, Semmes, Alabama. They each have graduated from the International College of Bible Theology, in Norris City, IL. with Terry and Angie earning a Bachelors degree in Biblical Studies, and Cindy earning an Associates degree. 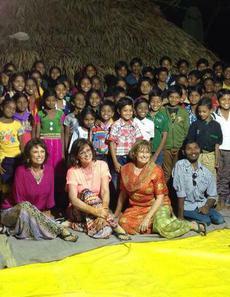 Cindy, Terry, and Angie are seasoned missionaries, having traveled to India 11 times beginning in 2004. They have also ministered in Mexico, and a Navajo reservation in Arizona. Terry has also been to Africa and Thailand sharing the Gospel. The sisters also travel to churches in the United States and share the Word of God. They minister through encouraging messages, as well as holding women's conferences internationally. They have also had training in deliverance, healing, and alter ministry. Contact Only Believe Ministries if you would like to schedule them to speak at your conference or church. Terry resides in Pope County, Illinois with her husband, Bob Kielhorn. Cindy resides in Galatia, Illinois. Angie resides in Carmi, Illinois with her husband, Markel Hoffman.